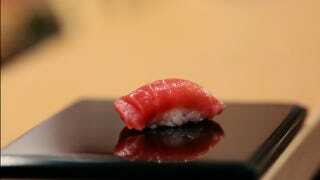 Jiro Dreams Of Sushi: You'll Never Be Half as Good at Anything. So Jiro Dreams of Sushi is a documentary about a guy who is really, really good at making sushi. But wait, bear with me, because it is also the best damn documentary about a guy who is really, really good at making sushi that you will ever see. It's actually a little inaccurate to call Jiro "good" at making sushi; he's arguably the best. Probably because he's an 80 year old workaholic who doesn't know how to do anything other than be a completely badass sushi chef. The documentary (in Japanese, so subtitles) chronicles day-to-day life at his absurdly specialized and artsy sushi-only restaurant in Japan, and the son he's training to take up the helm.